A charming and finely detailed, William IV period original watercolour of Charing Cross Hospital, London. 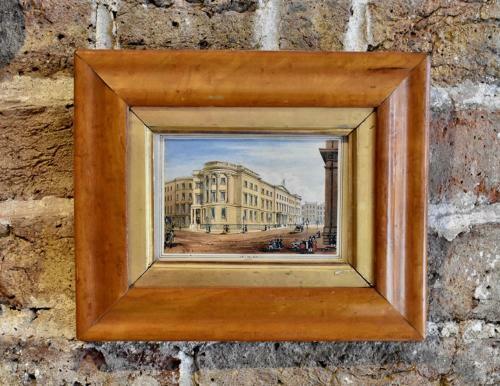 The picture features numerous figures in the foreground and would be ideal for anyone with a keen interest in London's classical architecture and the architect Decimus Burton. Dated 1833 and signed with the initials of the artist, TMN. In 1827 The Royal West London Infirmary became 'Charing Cross Hospital'. Plans were drawn up by architect Decimus Burton in 1830 and a site was found, just off the Strand (at what is today Agar Street). On 15 September 1831 the foundation stone was laid by the Duke of Sussex and the first completed ward was named after the daughter of the Duchess of Kent, Princess Victoria, who eventually became Queen Victoria. The hospital itself was completed in January 1834, at a total cost of £20,000.